Area: 48,845 sq. km. (about half the size of Maine). Land boundaries (total): 1,524 km. Austria 91 km. ; Czech Republic 215 km. ; Hungary 677 km. ; Poland 444 km. ; Ukraine 97 km. Cities: Capital: Bratislava (428,672). Other cities — Kosice (236,093), Nitra (163,540), Presov (161,782), Zilina (156,361), Banska Bystrica (111,984). Terrain: Landlocked with high mountains in the north, low mountains in the center, hills to the west, Danube River basin in the south. Climate: Temperate; average temperature in January 26.5°F; in July 68°F. Annual precipitation 24"-40". Elevation: Lowest point, Bodrog River 94 m. Highest point, Gerlachovsky Stít 2,655 m.
Nationality: Noun and adjective — Slovak(s). Population (May 2001 census*): 5,379,455. Annual population growth rate (2001 est. ): 0.13%. Ethnic groups (2001): Slovaks 85.8%, Hungarians 9.7%, Roma 1.7%, Czechs 0.8%, Ruthenians 0.4%, Ukrainians 0.2%, other 1.4%. Unofficial estimates place the Roma population between 6%-10%. Religions (2001): Roman Catholic 69%, Protestant 9%, Greek Catholic 4%, Orthodox 0.9%, other 0.6%, unknown 3.5%, 13% report no affiliation. Languages: Slovak (official), Hungarian, Ruthenian, Romany, and Ukrainian. Health: Life expectancy (2001): 78 yrs. females; 70 yrs. males. Work force (2.1 million in 2001): Industry, construction, commerce — 61%; financial, commercial, health services — 18%; government and education — 15%; agriculture — 6%. Branches: Executive: president (head of state), prime minister (head of government), cabinet. Legislative — National Council of the Slovak Republic (150 seats). Judicial — Supreme Court, Constitutional Court. Political parties: Distribution of the 150 parliamentary seats is Direction-Social Democracy (Smer-SD) 62 seats; Slovak Democratic and Christian Union (SDKU) 27 seats; Freedom and Solidarity (SaS) 22 seats; Christian-Democratic Movement (KDH) 15 seats; Bridge (Most-Hid) 14 seats; Slovak National Party (SNS) 9 seats. Other parties outside the Parliament include Hungarian Coalition Party (SMK); People's Party - Movement for a Democratic Slovakia (LS-HzDS); Party of the Democratic Left (SDL). Administrative divisions: Eight self-governing regions, 79 districts. Public deficit (2010): 7.8% GDP. Agriculture: Products: grains, potatoes, poultry, cattle, hogs, sugar, beets, hops, fruit, forest products. Industry: Types: iron and steel, chemicals, electro-chemical, automobiles, light industry, food processing, back-office support, engineering, building materials. Trade (2009 est. ): Exports: $55.4 billion: machinery and energy equipment, electrical equipment, audio/video equipment, vehicles, base metals, mineral products, plastics and rubber, iron and steel, machinery and energy equipment, plastics. Export partners (2009) — Germany 20.1%, Czech Republic 12.9%, France 7.8%, Poland 7.2%, Hungary 6.3%, Italy 6.1%, Austria 5.8%. Imports (2009 est.) — $53.7 billion: machinery, vehicles, electrical equipment, mineral fuels and oils, audio/video equipment, base metals. Import partners (2009) — Germany 16.8%, Czech Republic 12.3%, Russian Federation 9.0%, South Korea 6.8%, China 5.8%, Hungary 5.3%. (Source: Statistical office of the Slovak Republic). 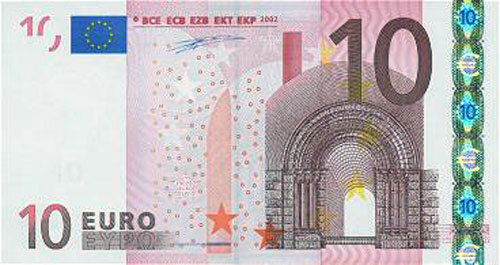 Foreign investment (2008, National Bank of Slovakia data): Cumulative — $39.4 billion; FDI inflow $1.39 billion in 2008. Sources of direct foreign investment** — Czech Republic 54.2%, Cyprus 20.4%, Poland 4.5%, Austria 4%, France 3.5%, South Korea 3.1%, Germany 3%, Italy 2.6%. Sectors of direct foreign investment — machinery, industrial production, electrochemical, automotive, financial services, information technology (IT), wholesale and retail trade, transportation and telecommunications. 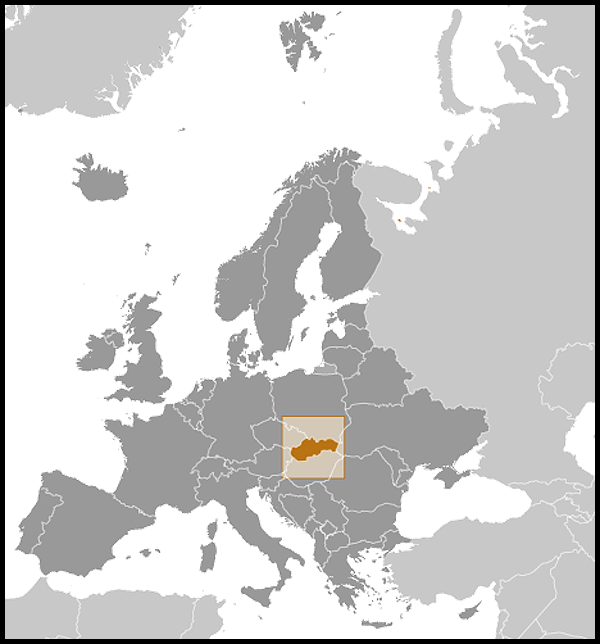 The majority of the 5.4 million inhabitants of the Slovak Republic are Slovak (85.8%). Hungarians are officially the largest ethnic minority (9.7%) and are concentrated in the southern and eastern regions of Slovakia. Up to 10% of the population is thought to be Roma, although the last official census (2001) put their number at 1.7%. Other ethnic groups include Czechs, Ruthenians, Ukrainians, Germans, and Poles. The Slovak constitution guarantees freedom of religion. The majority of Slovak citizens (69%) are Roman Catholic; the second-largest group is Protestants (9%). About 3,000 Jews remain of the estimated pre-World War II population of 120,000. The official state language is Slovak, and Hungarian is widely spoken in the south. Historians usually trace Slovakia's roots to the Great Moravian Empire, founded in the early ninth century. 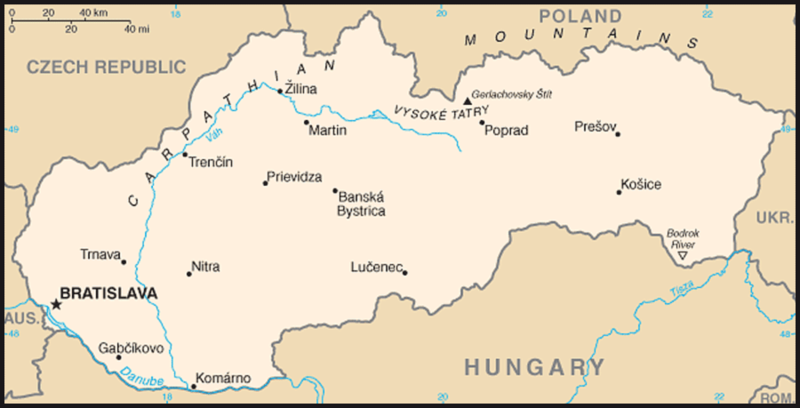 The territory of Great Moravia included all of present western and central Slovakia, the Czech Republic, and parts of neighboring Poland, Hungary, and Germany. Saints Cyril and Methodius, known for the creation of a Cyrillic alphabet, came to Great Moravia as missionaries upon the invitation of the king in the early 10th century to spread Christianity. The empire collapsed after only 80 years as a result of the political intrigues and external pressures from invading forces. Slovaks then became part of the Hungarian Kingdom, where they remained for the next 1,000 years. Bratislava was the Hungarian capital for nearly two and a half centuries after the Turks occupied the territory of present-day Hungary in the early 16th century. Revolutions inspired by nationalism swept through Central Europe in 1848, which led to the codification of the Slovak language by Ludovit Stur in 1846 and later the formation of the dual Austro-Hungarian monarchy in 1867. As language and education policies favoring the use of Hungarian, which came to be known as Magyarization, grew stricter, Slovak nationalism grew stronger. Slovak intellectuals cultivated cultural ties with the Czechs, who were themselves ruled by the Austrians. After the dissolution of the Austro-Hungarian State following World War I, the concept of a single Czecho-Slovakian unified state came to fruition. Tomas Masaryk signed the Pittsburgh Agreement, declaring the intent of the Czechs and Slovaks to found a new state in May 1918, and a year later became Czechoslovakia's first president. After the 1938 Munich agreement forced Czechoslovakia to cede territory to Germany, Slovakia declared its autonomy. Slovakia became a Nazi puppet state led by the Catholic priest Jozef Tiso. During this period, approximately 70,000 Slovak Jews were sent to concentration camps to perish in the Holocaust. Roma, while persecuted under the Tiso regime, were not deported by the Slovak Hlinka guards. An undetermined number of Roma were deported from the southern part of Slovakia when it was occupied by Hungary in 1944. The Slovak National Uprising, a brief insurrection against the fascist powers in August-September 1944, was put down by Nazi forces. At the conclusion of World War II, the reunified Czechoslovakia was considered within the sphere of influence of the Soviet Union. The communist party, supported by the U.S.S.R., took political power in February 1948 and began to centralize control. The next 4 decades were characterized by strict communist rule, interrupted only briefly during the Prague Spring of 1968. The Slovak-born Communist leader Alexander Dubcek presided over a thawing of communist power and proposed political, social, and economic reforms in his effort to make "socialism with a human face" a reality. Concern among other Warsaw Pact governments that Dubcek had gone too far prompted an invasion and Dubcek's removal from his position. The 1970s were characterized by the development of a dissident movement. On January 1, 1977 more than 250 human rights activists signed a manifesto called Charter 77, which criticized the government for failing to meet its human rights obligation. The so-called "Candle Demonstration," which took place in Bratislava in March 1988, was the first mass demonstration of the 1980s against the communist regime in Czechoslovakia. The demonstration, organized by Roman Catholic groups asking for religious freedom in Czechoslovakia, was brutally suppressed by the police. On November 17, 1989, a series of public protests, known as the "Velvet Revolution," began and led to the downfall of communist rule in Czechoslovakia. Dissident groups, such as Charter 77 in the Czech Republic and Public Against Violence in Slovakia, united to form a transitional government and assist with the first democratic elections since 1948. Several new parties emerged to fill the political spectrum. After the 1992 elections, Vladimir Meciar's Movement for a Democratic Slovakia (HZDS), which demanded Slovak autonomy as a matter of fairness, emerged as the leading party in Slovakia. In June 1992, the Slovak parliament voted to declare sovereignty, and the federation dissolved peacefully on January 1, 1993. Meciar's party ruled Slovakia for its first 5 years as an independent state. His authoritarian style as Prime Minister created international concerns about the democratic development of Slovakia. In the 1998 elections, HZDS received about 27% of the vote, but was unable to find coalition partners and went into opposition. An anti-Meciar coalition formed a government led by Mikulas Dzurinda, the chairman of the Slovak Democratic and Christian Union (SDKU) and began to pursue critical economic and political reforms. The first Dzurinda government enabled Slovakia to enter the Organization for Economic Cooperation and Development (OECD), begin accession negotiations with the European Union (EU) and close virtually all chapters of the accession acquis, and make the country a strong candidate for North Atlantic Treaty Organization (NATO) accession. However, the popularity of the governing parties declined sharply, and several new parties gained relatively high levels of support in public opinion polls. In the September 2002 parliamentary elections, a last-minute surge in support for the SDKU gave Dzurinda a mandate for a second term. He formed a government with three other center-right parties: the Hungarian Coalition Party (SMK), Christian Democrats (KDH), and Alliance of New Citizens (ANO). The main priorities of the coalition were ensuring a strong Slovak performance within NATO and the EU, fighting corruption, attracting foreign investment, and reforming social services, such as the health care system. Following a summer 2003 parliamentary shake-up, the government lost its narrow parliamentary majority and controlled only 69 of the 150 seats; however, because of conflicts among the opposition parties, the coalition was able to remain in power with the tacit support of Meciar's HZDS. Slovakia became a member of NATO on March 29, 2004, and joined the EU on May 1, 2004. All parliamentary political parties strongly supported Slovakia's NATO and EU accession. After parliamentary elections on June 17, 2006, Robert Fico became Prime Minister, leading a coalition of Direction (Smer-SD), the Slovak National Party (SNS), and the People's Party - Movement for a Democratic Slovakia (LS-HzDS). During Fico's tenure, the ambitious economic reforms of the previous government largely stagnated although, in most cases, they were not rolled back. Fico's government supported the mission in Afghanistan, increasing deployments from just over 50 to more than 300 while in office. In January 2010, Slovakia accepted three Guantanamo detainees for resettlement. The most recent parliamentary elections were held on June 12, 2010. Although Smer-SD gained the largest share of parliamentary seats, four center-right parties — SDKU, Freedom and Solidarity (SaS), KDH, and Bridge (Most-Hid) — formed a narrow governing coalition with the stated principal aim of attacking corruption, enhancing transparency, and returning to a more free-market economic agenda. SDKU's Iveta Radicova leads the government; she is the first female Prime Minister in Slovakia's history. Slovakia maintains a permanent mission to the United Nations in New York and consulates general in New York (since September 2003) and in Los Angeles (since April 2005). Slovakia has 11 honorary consulates; in Chicago, Cleveland, Dallas, Denver, Detroit, Indianapolis, Kansas City, Miami, Minneapolis, Pittsburgh, and San Francisco. The pace of economic reforms picked up during the second administration of Prime Minister Mikulas Dzurinda, which oversaw the simplification of the tax system, reforms of the labor code and pension systems, and a large number of privatizations. With the onset of the global recession in 2008, Slovakia's highly export-dependent economy began to contract, finishing that year with 6.4% growth, following 10.4% growth in 2007. The economy slowed rapidly in the first quarter of 2009 — contracting 12% from the previous quarter — as the deepening recession was exacerbated by a political crisis between Russia and Ukraine that led to a 3-week disruption of Slovakia's natural gas supply. A return to modest growth was forecast for 2010. Germany is Slovakia's largest trading partner, purchasing 20.1% of Slovakia's exports and supplying 16.8% of its imports in 2009. Other major partners include the Czech Republic (12.9% of Slovakia's exports and 12.3% of Slovakia's imports), Italy (6.1% and 3.7%), Russia (3.8% and 9.0%), Austria (5.8% and 2.9%), Hungary (6.3% and 5.3%), Poland (7.2% and 3.9%) and France (7.8% and 4.0%). Slovakia imports nearly all of its oil and gas from Russia and its export markets are primarily OECD and EU countries. More than 85.1% of its trade in 2008 was with EU members and with OECD countries (86.2%). Slovakia's exports to the United States made up 1.7% of its overall exports in 2008 ($1.21 billion), while imports from the U.S. accounted for 1.2% of its total purchases abroad ($847.24 million). The armed forces of the Slovak Republic number about 14,000 uniformed personnel and are made up of Land Forces, Air and Air Defense Forces, and a Joint Training and Support Command. Land Forces consist of two mechanized infantry brigades, as well as separate NBC (nuclear, biological, chemical), engineer, artillery, rocket, signal, and two support battalions. Air and Air Defense Forces are comprised of a fighter wing of MiG-29s and L-39s, a wing of Mi-24 attack and Mi-17 utility helicopters, a wing of L-410 and An-24/6 transport aircraft, and a surface-to-air missile (SAM) brigade. (The Mi-24s are scheduled to be retired in 2011.) Military police and two military intelligence services are under the command of the Ministry of Defense, and a special operations regiment falls under the command of the General Staff. The Ministry of Defense should complete a strategic defense review in late 2011 and begin restructuring the armed forces throughout 2012 and 2013; anticipated changes include consolidated headquarters, fewer facilities, and upgraded Air and Air Defense Forces. The armed forces are the most respected national institution according to recent opinion polling. As of August 2011, Slovakia had approximately 500 soldiers deployed in missions worldwide. Roughly 60% of deployed Slovak soldiers serve under NATO command (ISAF in Afghanistan), 30% under the UN (UNFICYP in Cyprus, UNTSO in the Middle East), and 10% under the EU (ALTHEA in Bosnia and Herzegovina, EUMM in Georgia). Defense spending was cut by more than 20% in the 2010 budget to 1.2% of GDP, dropped again in 2011 to just 1.1%, and is expected to remain at this level in 2012. Slovakia became a member of NATO on March 29, 2004 and joined the EU in May 2004. Slovakia is a member of the United Nations and participates in its specialized agencies. It is a member of the Organization for Security and Cooperation in Europe (OSCE), the World Trade Organization (WTO), and the OECD. It also is part of the Visegrad Four (Slovakia, Hungary, Czech Republic, and Poland), a forum for discussing areas of common concern. On December 21, 2007, Slovakia joined the Schengen zone. Slovakia maintains diplomatic relations with 134 countries. There are 35 embassies and 26 honorary consulates in Bratislava. Twenty Slovak experts served in EU-led civilian missions in 2010, including 17 police officers, one military expert, and two customs officers. The fall of the communist regime in Czechoslovakia in 1989 and the subsequent split of the two republics on January 1, 1993, allowed for renewed cooperation between the United States and Slovakia. The election of a pro-Western, reformist government in late 1998 further boosted close ties between the countries. The United States delivered more than $200 million in official direct assistance after 1990 to support the rebuilding of a healthy democracy and market economy in Slovakia, primarily through programs administered by the U.S. Agency for International Development (USAID). Slovakia and the United States retain strong diplomatic ties and cooperate in the military and law enforcement areas. The U.S. Department of Defense programs have contributed significantly to Slovak military reforms. Millions of Americans have their roots in Slovakia, and many retain strong cultural and familial ties to the Slovak Republic. President Woodrow Wilson and the United States played a major role in the establishment of the original Czechoslovak state on October 28, 1918, and President Wilson's Fourteen Points were the basis for the union of the Czechs and Slovaks. Tomas Masaryk, the father of the Czechoslovak state and its first president, visited the United States during World War I and used the U.S. Constitution as a model for the first Czechoslovak Constitution. The U.S. Embassy (http://slovakia.usembassy.gov/) in Slovakia is located at Hviezdoslavovo namestie 4, 811 02 Bratislava (tel: 421-2-5443-0861 or 421-2-5443-3338; fax: 421-2-5443-0096). Duty hours are Monday through Friday, 8:00 a.m. to 4:30 p.m. The embassy is closed on U.S. and Slovak holidays.